Graphic Novel Review 24/365: Miles Morales Spider-Man – Pull List Week! Please keep up with all of my old reviews as I quest for 365 in 365 days here. After an amazing review from Jason Nisavic yesterday, we are back to Pull List Week! And of course, I will plug my local comic book store: Alternate Reality, located on the corner of 111th and Kedzie in beautiful downtown Mt. Greenwood! Ask for Tim. Tell him Eric sent you. 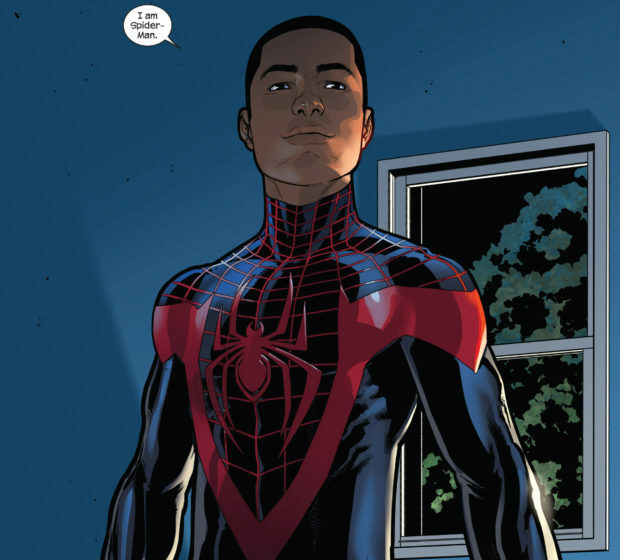 Hitting the Marvel Comics’ scene in 2011, Miles Morales struck a chord with many people, including myself. When Miles was first discovering himself and his abilities, he was just an 8th grade kid of Afro-Hispanic background freaking out about new-found super-powers. Not the normal white-bread Peter Parker, readers quickly took a side on this massive change in the beloved character. Don’t worry, Peter Parker has been back in like 15 different titles since then, but Miles is still around, and he’s still great! As someone fairly new to the comics’s scene, I call Miles my Spider-Man. And many in the new generation of comics readers also call Miles their Spider-Man. What’s to love about Miles is partially what is to love about Peter: he’s young, funny, fearless, a hero for the people of NYC. But now we can add to that that he’s a kid of color bringing with him a litany of family and social issues that are different from those brought to us by Peter Parker. He also brings some new super-powers to the character like the ability to camouflage himself into his environment and a venom sting, conducted through his hands that stuns enemies. As a reader, I was ready for a new Spider-Man, and Miles was (and is) it. What impresses me most about the Miles Morales book is its ability to grab a hold of readers. Last year, I had two male students that were self-proclaimed non-readers, but they took my graphic novel class anyway because that were into some comics as kids. These kids, like a few others that I’ve had, read every single issue of the Miles Morales comic that I put in front of them, even stopping in my classroom between periods to replenish issues if they had finished the ones that they got earlier in the day. I’m telling you, this Spider-Man is cool and speaks to kids in a way that a lot of older comics or other titles do not. 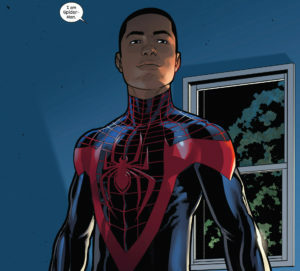 We have Miles Morales stating that he does not want to be the “black” Spider-Man. He just wants to be Spider-Man. I’ve taken this question and posed it to my class. Is it important for Miles to be the first black Spider-Man, or is he just Spider-Man? The same question can be posed about Barack Obama (about being President…not Spider-Man), opening up the classroom to intense but rewarding conversations. Tomorrow, I will be speaking about another character in the Marvel Universe with some of the same benefits: Ms. Marvel. I hope you go pick up some Miles Morales from your local comic book shop, and I hope you read tomorrow’s post that will continue this discussion.